Discussion in 'Audio Hardware' started by monkboughtlunch, Jul 28, 2014. Shure recommends 1.5 -3 grams for the M44-7. Has anyone experimented and found the optimal settings for this cart for non-DJ, home listening applications on a Technics 1210 M5G to achieve the best sound and minimize record wear? I'm NOT using this cart for DJ scratching applications, but rather I am using it for home listening of vintage 60s records on Technics 1210 M5G. Will 3 grams tracking force cause record wear? Will tracking force just above 1.5 grams be too light and cause inner groove distortion? I have this cart and a M5G. I rarely use it, maybe if I'm going to do a 45 listening section as it's really good with those. I think I keep the tracking around 1.5 and have never had an issue. I set the anti-skating using a blank LP but when in doubt just have it equal the tracking force. As for arm height, I lower the stylus on a record and adjust the tonearm until it's level, it's easy if you use an index card with blue lines on it held flat on the record just behind the tonearm, look through the bottom of the tonearm and adjust until the blue line and tonearm are parallel. As always, experiment with what works best, if you're getting igd then make the tracking force heavier. Set the tracking force near it's upper limit (3 grams will not cause excessive record wear). Turn the anti-skate to zero. You don't need it with the higher tracking forces. Set the arm in a position so that the cartridge body is more or less parallel to the lp with a slight tail drag and call it good. This cartridge is not very sensitive to VTA adjustments. Not to intrude, but I recommend and suggest the SC35C as a similar animal, but massive sonic upgrade compared to what you are currently using. Just something to think about, that's all. If you want the lighter tracking version, get the "G" stylus - it's a 0.6 mil though, and lower output. And the G stylus is less brash and more refined sounding. I've used both an M44-7 and M44G with good results on old records, but I recently switched to using an M78S (exact same body as the SC35C and M35X) with an M35X stylus. The M35X is a more refined version of the SC35C, and tracks at 1.5-3 grams. It sounds more open and less bloated than the M44-7/M44G. Supposedly the M35 body was derived from the V-15 Type V!! sami and McLover like this. How would the M44 compare to an Ortofon OM30? Would the sound quality be similar with just poorer tracking resulting in IGD? OM 30 is very different in the tonearms it plays best on and the application and sound quality. Again, the M 44-7, M 44-G and M 35x track well when set up with care and aligned correctly. On real world records. I can track a M 44-7 at 1.75 grams and track most records well on my Audio-Technica ATP 16-T tonearm. ...Not to intrude, but I recommend and suggest the SC35C as a similar animal, but massive sonic upgrade compared to what you are currently using. Just something to think about, that's all. I ditched my AT33PTG/II for an SC35C, it's really an incredible cartridge. I've also settled with the M35X as my cart for singles and some vintage records, and track it at 2 grams. My V15 Type II with the .3 x .7 elliptical Jico is fortunately outstanding with most older records, so the M35X is mostly relegated to 45's, where it shines. 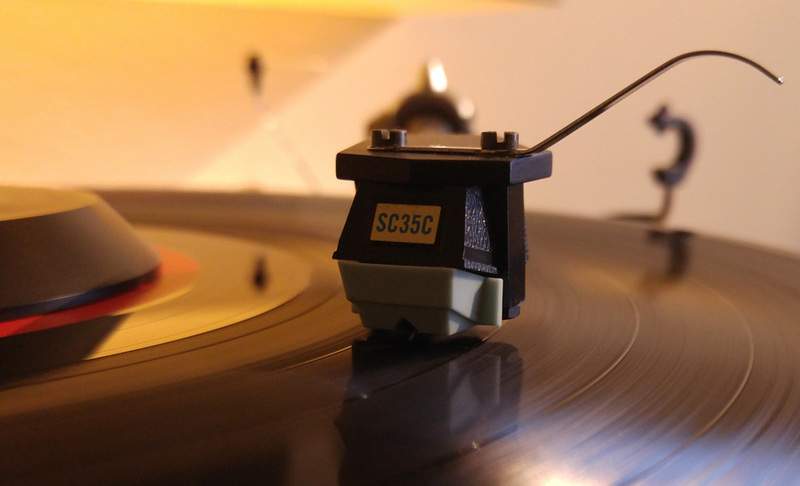 If you want to really hear the SC35 sing, get styli from Expert for it. I'd guess a Jico would possibly be nice as well (though I have not heard one of those in that cartridge). I've actually got a JICO here but have yet to try it out yet, I'm seriously enthralled with the NOS US made stylus for now. I should check out the JICO this weekend though for sure. I'm currently running the SC35 with a SAS for most modern records, and putting the Shure original back in (with weight plate blutacked to the headshell) for singles, monos etc. Best of both worlds. bootbox and MMM like this. No to question one. Yes to question two and it might skip on less-than-perfect records. I have the granny of that cart, a NOS, 1977 USA-made M44C; tracking force 3-5 grs. Set it at 3 grs, no record wear, no IGD. Sounds INCREDIBLE. It's my all-purpose cart and I don't feel like upgrading ever. Better sound than my cd player. Does the SAS stylus for the SC35 have the boron cantilever too? I think I'd like to hear an SAS without the boron cantilever for a change. Just curious. Yes, the SC35SAS uses a Boron rod as cantilever.